A lot of people dismiss Isaac Asimov as just an author - oh, a landmark in the sci-fi field, no doubt, but still, his importance is seriously underestimated. Why? Because he came up with the Laws of Robotics, and those are going to save our species from annihilation one day. Seriously, every time someone skips them, it ends in messy disaster - even if the robots aren't trying to be homicidal, if they don't have the Laws, they'll wind up going on a murder spree by mistake anyway. In and of themselves the Clockwork Men - "Clockwork Repair Droids," to give them their proper title - aren't really that high up the malevolence food tree. They're not out to conquer the universe, their plan (such as it is) wouldn't work even if no one stopped them, and even when they get around to the traditional monster activity of threatening to kill the companions, the Doctor defeats them despite being staggeringly drunk at the time. Not much of a score for villainy, but you have to admit, they're 10 out of 10 for presentation - they may be mechanical morons carrying out a preposterous and unworkable plan, but they look damned swish while they're doing it. There are two variant Clockwork Men - for convenience's sake, let's call them Blue and Black, after their coats. 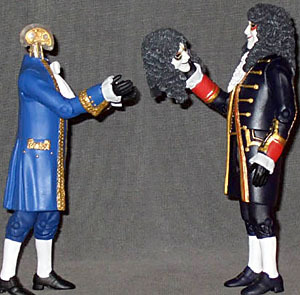 Both are more or less French noblemen in fancy dress masks, and when you consider the budgetary constraints these figures are being manufactured with, they do quite a good job of packing in the necessary costume detail. Both sport fancy cravats, long coats with highly detailed gilded seams, frilled cuffs, tight calf socks and buckle shoes, and but for the insane grins on their masks (and the weapons, if you use them) they'd pass quite well for historical action figures. Impressively, for "variants" they're quite distinct from one another, and it's not just paintwork: the legs, torso, hands and head/mask are identical (though the trousers are repainted appropriately to their costumes), but the coat and underlying waistcoat - everything you actually see between the hips and neck - the arms, and the weapons are individual sculpts, with Black sporting a high waistcoat and banded coat buttoned at the breast, and Blue a longer waistcoat and a simpler coat, with turned-back cuffs and a straighter cravat. The heads and masks are identical, but the paint differentiates the masks: Blue has a darker mask, with a black inner mouth and eye surrounds and red beneath the eyebrows, while Black reverses the colours for a redder look. Compared to the intricate gilding on the masks as seen on TV these are simplified versions, but they convey the right impression, especially that creepy grin they have. The mask is surrounded by a heavy black wig, intricately sculpted with curls and given a restrained grey drybrush to pick out the highlights. 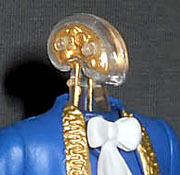 The masks are removable (and interchangeable, so if you have more than two Clockwork Men you can create more variants), and beneath is the droid's true head, a transparent case containing gold clockwork parts. Like the mask, the clockwork is heavily simplified - there's no other choice at this scale - but the combination of several layers of parts, semi-obscured behind the thick plastic sheath, again gives a convincing impression. Black and Blue have identical articulation, which is pretty much the standard layout that the Doctor Who line, after its initial series, has evolved into. The base of the neck (of the clockwork head, that is) is a swivel joint, but the soft plastic mask sitting over the interior head effectively creates a balljoint, so together you can move the head in all three axes, so far as the wig permits. The arms are just peg shoulders, pin elbows and peg wrists - no bicep swivel, unfortunately. The hips are swivel/peg balljoints, able to move decently due to the long coat being soft, and there are hinge knees. They won't be competing for Articulated Figure of the Year, but they can get by nicely, especially since they're meant to look stiff and robotic anyway. Each Clockwork Man comes with a weapon - which is probably some sort of repair tool - that slots into their right cuff, underneath the ruffles. The weapons are similar but not identical - both are silver rods, made to look as if they're several segments, with gold wheels and gears set into them. Black's weapon has a sharp, serrated end; Blue's ends in a pair of squared-off prongs. 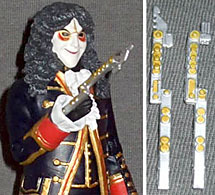 The Clockwork Men aren't going to top anyone's must-have Doctor Who figure list - they're not Daleks or Cybermen. But they're memorable, in their own quirky way, and these figures portray them well - one or two of them make a valuable addition to any Doctor Who collection, and if you find them discounted (which is likely, as they and the Ood seem to have had a high proportion in the case packs of series two, so they can still be found), you could do a lot worse than have three or four, trotting around as a little "repair crew."